Drivers take heed: You are more likely to be injured or killed in a work zone on a dry and sunny August afternoon than any other time of year. That’s what Ohio Department of Transportation (ODOT) safety experts discovered after analyzing 10 years of crash statistics. In a report just released by ODOT, data shows that there were 5,038 work zone crashes last year resulting in 1,262 injury crashes and 10 fatal crashes – down from 5,105 crashes, 1,286 injury crashes, and 13 fatal crashes in 2009. 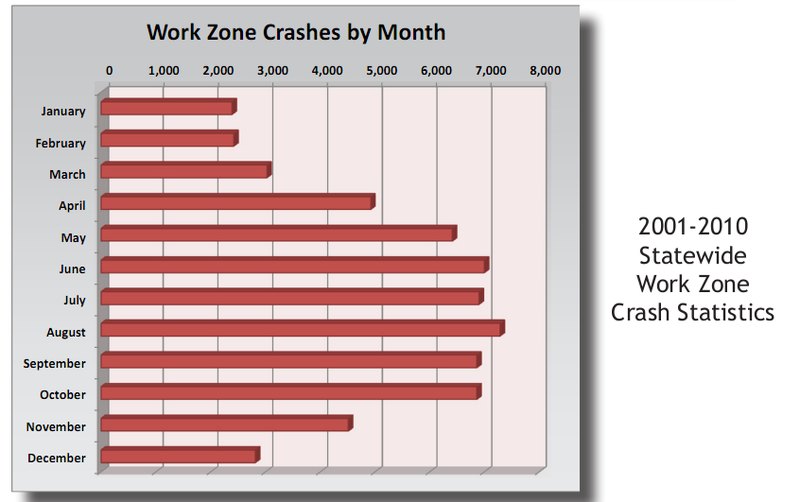 According to ODOT’s analysis, the top three causes of work zone crashes can be prevented. They include following too closely, failure to control and improper lane changes. For up-to-the-minute road conditions and details on highway construction projects in every area of the state, visit ODOT’s website www.BuckeyeTraffic.org. For up-to-the-minute road conditions and details on highway construction projects in every area of the state, visit ODOT’s website www.